Including both a PDF and word document version of this assignment - you may not have all the same fonts I do so the word document will be altered due to this! 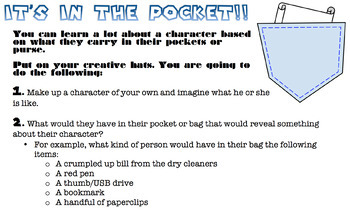 This activity requires students to make a list of 5 items a character would carry in their pockets. They then write a short narrative describing the character that would have these five items. Finally, they swap their list with another student and write about the character they think would carry these five items. Although I am using this in conjunction with The Curious Incident of the Dog in the Night-Time, it is a good way to discuss what objects say about a person/character. It is a good way to intro or further discuss indirect characterization as well as inferences. Take an item and infer what you can learn about that character based on this item. Alter: You might also choose to have students create a list of items a specific character might carry about them based on what they know about that character.